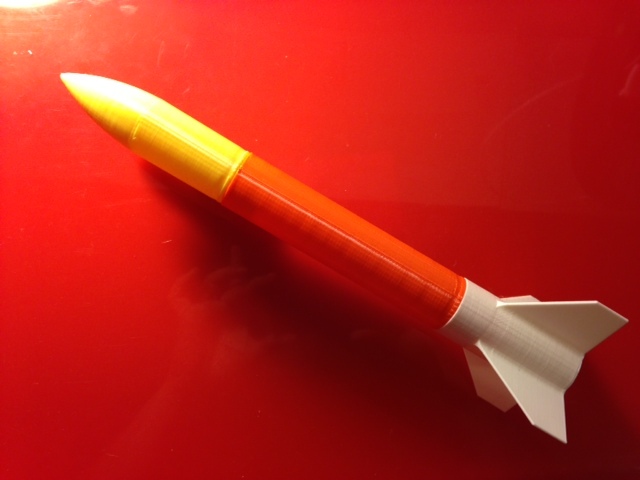 Today we made a copy of landru's Modular Model Rocket from Thingiverse. Settings: Standard "low" MakerWare setting, with a raft. Printed the three pieces separately in about two hours total. Technical notes: I had to fiddle with the diameters of the pieces to get landru's model to fit together properly when printed on my MakerBot (on "low" setting, at least), as well as combine the top piece of the rocket with a cylinder piece. With the size and settings I used, the walls of the rocket are two filament paths thick. Since the pieces snap together, you can print something larger than the MakerBot would normally allow; as printed here it is about 260 mm tall.